I have this neat new cellulose conversion process. I am looking for funding and working on a patent application. The invention is a personal cellulosic biomass reactor. In the first reaction step, the cellulose is partially converted to CO and H2 (syngas). In the second step, one could do many things with the syngas: produce methanol, ethanol, Fischer-Tropsch diesel, or combust it for heat or electricity. I chose the combustion for heat route, which occurs very rapidly following the 1st step. The combustion products are CO2 and water, but the CO2 that is released is equivalent to the CO2 that was taken up by the biomass while it was growing. It is therefore neutral with respect to Greenhouse Gas emissions. I am hoping to get some government subsidies, or possibly Silicon Valley startup money for my invention. You can see a picture of it below. And there you have an example of how technical terminology and buzzwords can be used to confuse people. This is currently happening with cellulosic ethanol, so I thought I would write this essay to talk about the differences between cellulosic ethanol and biomass gasification. A popular trend in the media lately – encouraged by various ethanol advocates – is to liberally apply the “cellulosic” label. It has become a buzzword. This is the same thing that has occurred in the field of nanotechnology. Since lots of research funding is available for nanotechnology, things like ultra-fine powders are now being called nanotechnology. This trend is being driven, in my opinion, by a bid for some of the money flowing to the nanotechnology sector. This brings us to some of the recent claims of a big breakthrough in “cellulosic ethanol” technology. However, one of the “breakthroughs” – biomass gasification – has been around for decades, and the technology is quite different from what is commonly denoted as cellulosic ethanol. It is not completely clear to me why some advocates are so eager to blur the distinction. Perhaps the law is written such that there is a danger of not receiving ethanol subsidies if a combustion process is used. Perhaps they want to be the first to claim commercial success of “cellulosic ethanol.” Perhaps they just want to give the public and the government the impression that great strides are being made in cellulosic ethanol technology, thereby encouraging more money to flow in that direction. While cellulosic ethanol has only recently gained buzzword status, the term has been around for decades. The historical definition of the term implies certain particular process steps. There is some variance from process to process, but the things that are common are that the cellulose in the plant material is broken down into simple sugars, and then the sugars are fermented into ethanol. More money than ever before is being poured into cellulosic ethanol, but there are multiple hurdles that have proven difficult to overcome. For a good layperson’s overview of the process, I recommend the recent article in the Chicago Tribune: Beyond corn: Ethanol’s next generation. I think the article paints a balanced picture of the technology. In brief, there are three major hurdles that have proven challenging to resolve. The first is that plants have evolved defense mechanisms to prevent the cellulose from being easily broken down. Cellulose is actually a polymer – a long chain of connected sugars, and it is intermingled with hemicellulose and lignin. Cellulose provides structural strength to the plant walls. If it was easily broken down, microorganisms could attack the plants and limit their structural stability. What this means is that the cellulose must first be broken down with steam or a strong acid into component sugars that can be fermented, and this adds to the production costs. It is primarily this step that differentiates cellulosic ethanol from grain or sugarcane ethanol. The second challenge is common to all ethanol fermentation processes, but not to gasification processes. The ethanol that is produced in a fermentation process is highly diluted with water. In fact, the ethanol produced from fermenting grain typically makes up only 15-20% of the solution, with the remainder being mostly water. For cellulosic ethanol, the picture is much worse. The crude ethanol in this case is typically less than 5%, with the remainder being water. Separating water and ethanol is a very energy-intensive process. Even where the EROEI is highly favorable, as is the case with sugarcane ethanol, the distillation step takes up a substantial amount of energy. While the distillation energy in the case of sugarcane is provided by burning the bagasse, separating out that much water is still a major energy sink. I don’t want to paint too grim a picture of the future for cellulosic ethanol. It is possible that all the hurdles will be overcome. But I also don’t want to present an overly optimistic scenario in which multiple bottlenecks are merely hand-waved away, and successful resolution is presumed. The challenges are well-understood. There just isn’t a clear path at this point to solving them all, and a process with multiple challenges will face a lower probability of success. Biomass gasification is different from cellulosic ethanol in at least two major respects. First of all, it is a combustion process, not a fermentation process. 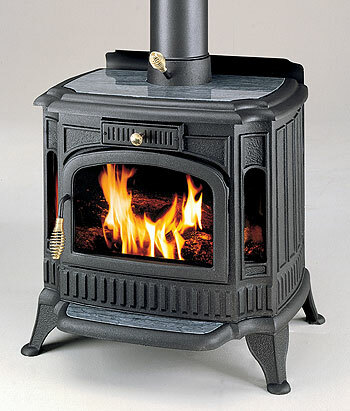 As a combustion process, it can be self-sustaining once the combustion is initiated. It does not require continual inputs of energy as is the case with a fermentation process. The products of biomass gasification are syngas and heat, if the reaction is operated in an oxygen-deficient mode, or CO2 and steam (and much more heat) in the case where sufficient oxygen is supplied. In the case of the former, the syngas can be further reacted to make a wide variety of compounds, including methanol, ethanol, or diesel (via the Fischer-Tropsch reaction). A biomass gasification process followed by conversion to a liquid fuel is commonly referred to as a biomass-to-liquids (BTL) process. However, there is one other major factor that differentiates biomass gasification from cellulosic ethanol. Biomass consists of a number of different components, including cellulose, hemicellulose, and lignin. In the case of cellulosic ethanol, only the cellulose and hemicellulose are partially converted after being broken down to sugars. The lignin and other uncoverted carbon compounds end up as (wet) waste, suitable for burning as process fuel only if thoroughly dried. Conversion is limited to those components which can be broken down into the right kind of sugars and fermented. Gasification, on the other hand, converts all of the carbon compounds. Lignin, a serious impediment and waste product in the case of cellulosic ethanol, is easily converted to syngas in a gasifier. The conversion of carbon compounds in a gasification process can be driven essentially to completion if desired, and the resulting inorganic mineral wastes can be returned to the soil. Gasification processes are of course not limited to biomass. In fact, biomass is currently the last feedstock of choice for economic reasons. It is much easier to transport natural gas and feed it on a continuous basis to a gasifier. In fact, most syngas in the U.S. today is made from natural gas. Coal is another option for gasification, and coal gasification is currently the dream of Montana Governor Brian Schweitzer. While natural gas is easier to handle, and coal is cheaper, biomass is the only option capable of producing sustainable energy and mitigating greenhouse gas emissions. It is therefore the option that is most desirable, in my opinion. It is also a better option than most other “renewable” alternatives like corn ethanol or cellulosic ethanol. The conversion is much higher for gasification, and the energy return will undoubtedly be better because the product won’t need to be removed from an aqueous solution. Compared to cellulosic ethanol, there are few technical challenges to solve with biomass gasification. The problems with biomass gasification aren’t technical, they are economic. 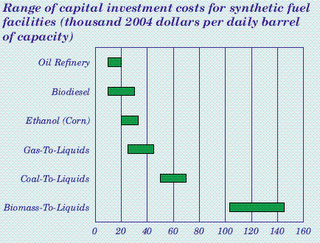 According to the EIA’s Annual Energy Outlook 2006, capital costs are $15,000-20,000 per installed barrel for a conventional oil refinery, $20,000-$30,000 for an ethanol plant, around $40,000 for gas-to-liquids (GTL), around $60,000 for coal-to-liquids, and around $120,000-$140,000 for biomass-to-liquids. The reasons for this should be obvious – it is much more difficult to handle biomass than to handle natural gas, for instance. Until we are willing (or forced) to pay a penalty for using fossil fuels, or are willing to pay a premium for renewable energy, biomass gasification is going to be passed over in favor of lower capital options. In the long-term, though, biomass gasification has staying power as an option for using biomass as a transportation fuel. What actually prompted my interest in writing this essay were the media reports of Vinod Khosla’s latest alternative energy venture. This has been hailed as a breakthrough in cellulosic ethanol. While some may consider this a subtle distinction, I think it is very important that people understand the difference. It may make sense to preferentially fund gasification options over cellulosic ethanol options, but this will be more difficult if the public doesn’t understand the difference. In the corner of an unmarked warehouse tucked away in an industrial neighborhood north of Denver, a new company called Kergy has what is, to my knowledge, the first anaerobic thermal conversion machine (which explains why Khosla Ventures is a seed investor). It’s a 6- by 4-foot contraption that stands about 8 feet high. 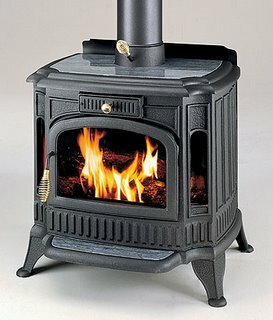 It looks vaguely like a souped-up potbellied stove. But it runs cleanly enough to operate indoors. Kergy’s machine is special because it makes cellulosic ethanol through anaerobic thermal conversion rather than through fermentation or acid hydrolysis. It does not need organisms or enzymes to do its work. Biomass is heated in an oxygen-free environment to produce carbon monoxide and hydrogen. Once that happens, “the world is your oyster,” says Bud Klepper, the engineer who invented this device. The carbon monoxide and hydrogen are then reconstituted into various alcohols – like ethanol. Better still, fermentation and acid hydrol¬ysis can take days to occur, but thermal conversion breaks down organic matter and converts it to ethanol in minutes. And here’s the really exciting part: Because all organic matter contains carbon, Klepper can make ethanol out of cellulose or any form of organic matter. This means the usual suspects such as corn, switchgrass, sugarcane, and miscanthus but also any waste product such as wood chips, paper pulp, cow manure, and even human waste. Municipal sewage has been tested already, as has hog manure. “We could double the ethanol output of the Mead facility,” Klepper says. It’s a big leap forward on the biohol trajectory, and it is right in front of us. In back of Kergy’s warehouse, workers are busy putting the finishing touches on a beautified and expanded version of his original thermal convertor. The new one is made out of lustrous red I-beams, shiny metal tanks and coils, bright blue metallic joints, and a porous metal-grating floor. The whole thing is 14 feet high, 40 feet long, and 25 feet wide and is capable of producing 15,000 gallons of ethanol a day. And the machine can be scaled for far more capacity. Just finished reading the Wired essay. Of course I disagree with several of the things you wrote, but that isn’t the purpose of this e-mail. What I am particularly interested in are the claims on “anaerobic thermal conversion.” Some people have been calling this cellulosic ethanol, but that’s really a misnomer because it is a completely different process. It is actually biomass gasification to produce syngas, a technology that has been around for at least 30 years. So it certainly isn’t “the first anaerobic thermal conversion machine.” Lots of people have done this, just not commercially. The technology for turning the resulting syngas into methanol, ethanol, or even diesel (via the Fischer-Tropsch reaction) has also been around for many years. As I am sure you know, the reason this hasn’t been done commercially before is the high capital costs per barrel of product. But I just did a patent search, and saw that Klepper has been issued a patent on the process. It just isn’t clear to me what distinguishes his patent from those that came before. Do you know? I am not trying to downplay the invention; differences in patents are often very subtle. But I am trying to determine how his patent differs from all of the other biomass gasification patents. I will say that I believe you are on the right track with biomass gasification. I have never had any concerns about this technology, and I believe that this is clearly the future. I just don’t know if it will be commercially viable without subsidies or mandates, because it is much easier (and far less costly) to do the same process with natural gas (GTL). But it is certainly more efficient to gasify biomass than it is to ferment it. I think you will find that it would be far more efficient to turn the syngas into diesel, but you might lose out on the subsidies. I guess if the government accepts this process as cellulosic ethanol, then maybe they would accept that product as biodiesel (which would qualify for the subsidies). He responded, but on the topic of Kergy he wrote “I am not interested in public disclosure of what we are doing at Kergy at this stage. Hope you understand.” Of course I wasn’t asking for proprietary information; I just wanted to know what distinguished this patent from previous gasification patents. Again, my purpose here is certainly not to denigrate those involved with Kergy. In fact, if an opportunity hadn’t come up recently at work (see the note at the end), I would seriously consider working for them. Mr. Khosla and I have discussed this, and I was contacted over the weekend by one of their Senior VPs. I think what they are doing is definitely a step in the right direction, and I think it would be fun to be a part of it. I just want people to understand that this is not brand new technology, so they shouldn’t think that the cellulosic ethanol problem has suddenly been resolved with a breakthrough. Biomass gasification certainly works, but it worked 20 years ago. It is just a capital-intensive process that has the problem of competing against lower cost (but unsustainable) gasification options. I recently accepted an offer to take up a management position within my company in Aberdeen, Scotland. I will be responsible for 10-15 engineers in our Europe and Africa business unit. Most of the work will involve exploration and production projects in the North Sea, but the best draw of all is that my family and I love Scotland. My report date is February 1, 2007, and I will be pressed for time between now and then. Therefore, my posting will be sporadic over the next few months. Hopefully, after I get settled in over there, I can start contributing again on a regular basis. I have lived in Europe before, and I am slowly archiving the essays on our previous trips at Traveling in Europe. I plan to keep this updated as we travel around Europe. I will continue to maintain the same Gmail address, so feel free to contact me there with questions or comments. Great article! I love your Personal Cellulose Reactor! I got a lot of good leads out of this story. Thanks!